Woodshed Art Auctions will hold its first live gallery auction (online, too) on Thursday, July 12th, in Franklin, Mass. Oil on canvas abstract drip painting attributed to Jackson Pollock (Am., 1912-1956) (est. $80,000-$120,000). 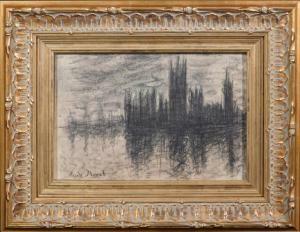 Charcoal on paper attributed to Claude Monet (Fr., 1840-1926), titled Westminster Study (est. $80,000-$120,000). Oil on canvas abstract Portrait of a Woman attributed to Willem de Kooning (Dutch, 1904-1997) (est. $150,000-$250,000). 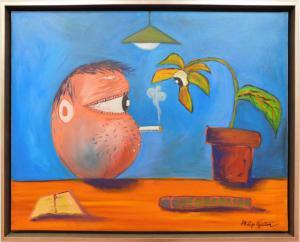 Oil on canvas painting attributed to Philip Guston (Am., 1912-1980), titled Smoking Head with Plant (est. $150,000-$200,000). Artworks attributed to Jackson Pollock, Claude Monet and television art personality Bob Ross are a few of the offerings in the sale, starting at 5:30 pm EDT. FRANKLIN, MASS., UNITED STATES, July 5, 2018 /EINPresswire.com/ -- FRANKLIN, Mass. 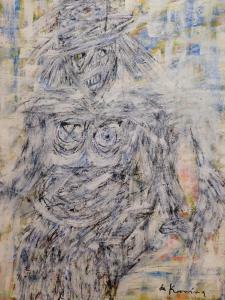 – Artworks attributed to Jackson Pollock, Claude Monet, Andy Warhol and other fine art luminaries are just a few of the offerings in Woodshed Art Auctions’ next auction on Thursday, July 12th, online (per usual) and live (something new) in the firm’s 500 Gallery, at 475 Franklin Village Drive in Franklin. Live bidding will start promptly at 5:30 pm Eastern time. “We’ve enjoyed amazing growth,” said Bruce Wood of Woodshed Art Auctions. “For the first time we’ve dedicated a gallery for previews and live events. It’s allowing us to feature larger paintings and we’re drawing the attention of new consignors.” Previews will be held Wednesday thru Friday, from 10-5, and Saturday, from 10-3. The sale is officially titled an Impressionist & Modern Paintings & Drawings Auction. The full color catalog, showing all 271 lots, can be viewed now, at www.woodshedartauctions.com, as well as on LiveAuctioneers.com. People can register to bid on either site. The auction is filled with rare and market-fresh paintings and drawings from private collections across Europe and the Americas. Included is an Italian watercolor by John Singer Sargent; large canvases by Pollock, Helen Frankenthaler, Willem de Kooning and Oswaldo Guayasamin; and sketches and works attributed to Warhol, Basquiat, Wifredo Lam and Henri Toulouse-Lautrec. The artworks attributed to Pollock and Monet both carry estimates of $80,000-$120,000. The Pollock attribution is an oil on canvas abstract drip painting, 73 inches by 73 inches, unsigned, with a new stretcher. The work is representative of the artist’s inimitable style, one where he’d fling and drip thinned enamel paint onto an unstretched canvas laid onto the floor of his studio. The Monet attribution is a charcoal on paper titled Westminster Study and is possibly a study for the artist’s painting Westminster Palace. It measures 13 ¼ inches by 17 ¼ inches, unframed, and comes with a certificate of authenticity from Jacob van Hassel Galerie in Rotterdam, Holland. There is also a stamp from Galerie Simon in Paris. The painting is artist signed on the lower left. •	An oil on canvas abstract Portrait of a Woman attributed to Willem de Kooning (Dutch, 1904-1997), 51 inches by 39 ¼ inches and signed bottom right (est. $150,000-$250,000). •	An oil on canvas abstract composition attributed to Franz Kline (Am., 1910-1962), 31 inches by 60 ½ inches, in the frame, artist signed lower right (est. $150,000-$200,000). •	An oil on canvas done in the manner of Jean-Michel Basquiat (Am., 1960-1988), titled Portrait of Man with Flowing Hair, 59 ¼ inches by 48 inches (est. $150,000-$200,000). •	An oil on canvas attributed to Philip Guston (Am., 1912-1980), titled Smoking Head with Plant, 35 ¼ inches by 44 ¼ inches framed, signed lower right (est. $150,000-$200,000). •	An untitled (Fear) oil on canvas with new stretcher attributed to Oswaldo Guayasamin (Ecuadorian, 1919-1999), 52 inches by 65 inches, artist signed (est. $120,000-$150,000). 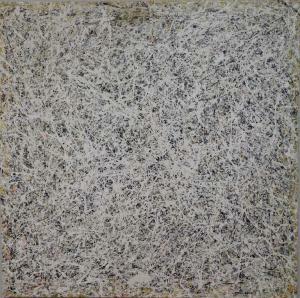 A pair of untitled abstract paintings are also expected to post strong results. One is a framed oil and enamel on canvas attributed to Mark Rothko (Am., 1903-1970), 64 ¼ inches by 44 ¾ inches, signed and dated “1948” (est. $80,000-$120,000). The other is an acrylic on canvas, unstretched, attributed to Hans Hofmann (Am., 1880-1966), 30 inches by 23 ¾ inches, signed and dated “64”. A pair of ink and watercolor artworks attributed to Marc Chagall (Russ./Fr., 1887-1985) both carry estimates of $60,000-$80,000. One was executed on the half-title page of the book The World of Marc Chagall (1968). It’s 13 inches by 9 ¼ inches (unframed) and signed, dated and inscribed. The other is titled Le Femme Oiseau and is 20 inches by 13 ½ inches, also unframed. Andy Warhol (Am., 1928-1987) is also represented multiple times in the sale, with attributions that include a graphite and watercolor on paper titled Dollar Bill, 11 ¾ inches by 14 ¾ inches unframed, signed (est. $20,000-$30,000); and an oil on canvas titled Coca Cola, depicting the iconic soft drink, 15 ¾ inches by 12 inches unframed, signed on top edge (est. $30,000-$40,000). Who can resist Banksy (Br., b. 1974), the anonymous England-based graffiti artist? A stencil on painted wood panel attributed to the artist, titled Paparazzi Rat, unframed and 21 ½ inches by 21 inches, signature stenciled lower right, should realize $40,000-$60,000; while a mixed media on paper (watercolor, gouache and graphite) attributed to Amedeo Modigliani (It., 1884-1920) titled Caryatid Figure, signed, unframed and 16 inches by 10 ½ inches, should make $15,000-$35,000. A gouache on paper attributed to Fernand Leger (Fr., 1881-1955), titled Abstract Woman with Fruits, measuring 13 ½ inches by 17 ½ inches and signed “F.L.” bottom right, is expected to fetch $40,000-$50,000; while an oil on paper abstract composition by the American-Armenian artist Arshile Gorky (1904-1948), 14 inches by 18 ½ inches, signed, should hit $35,000-$45,000. An oil on canvas Mountain Landscape done in the manner of Edgar Alwin Payne (Am., 1882-1947), signed and measuring 14 inches by 17 inches in the frame, has an estimate of $15,000-$25,000. Also, an oil pastel on paper attributed to Mario Tozzi (It., 1895-1979), titled Face of a Woman, signed in graphite and 15 inches by 10 ¾ inches unframed, should hit $6,000-$8,000. For more information about Woodshed Art Auctions and the Impressionist & Modern Paintings & Drawings Auction slated for Thursday, July 12th, please visit www.woodshedartauctions.com.